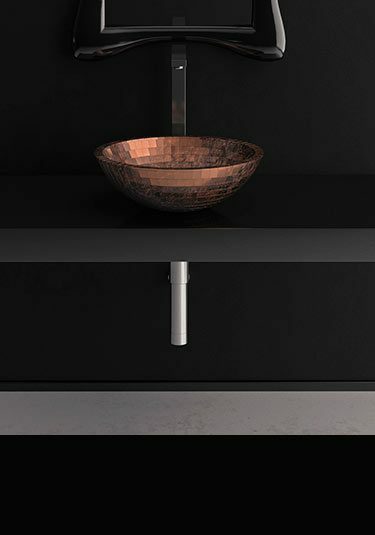 Livinghouse supply top quality European counter top sinks and counter basins designed for high end and luxury bathrooms. These deck mounted basins are designed for bathroom work top installation and are available in many different sizes and dimensions. Within our designer bathroom sink collection we have high, low and slim basins in round, oval, square and rectangular shapes to suit all bathroom design themes. 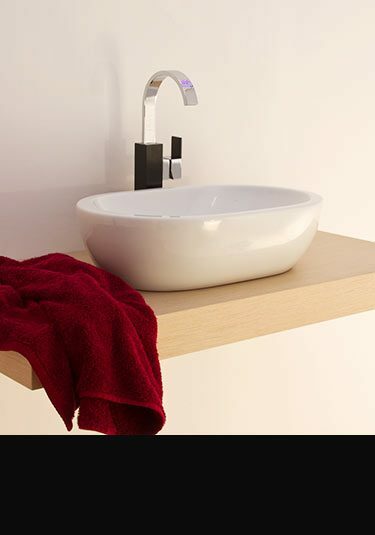 A lovely styled worktop basin that is low in profile. 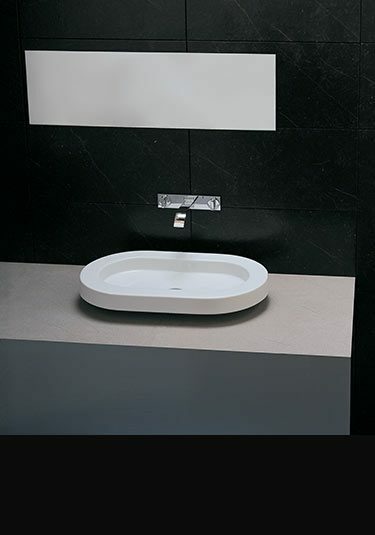 This slim basin has contemporary counter top styling and is pretty design choice for luxury bathrooms. 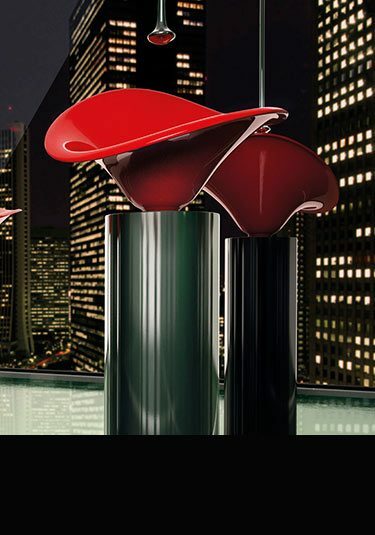 A stunning designer basin in a flower themed design, is made in the latest composite technology. 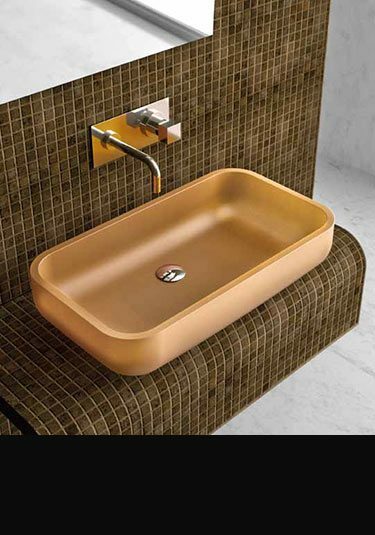 This exclusive luxury sink is available in a beautiful vivid red, white, black and gold leaf finish. Definitly a design feature. 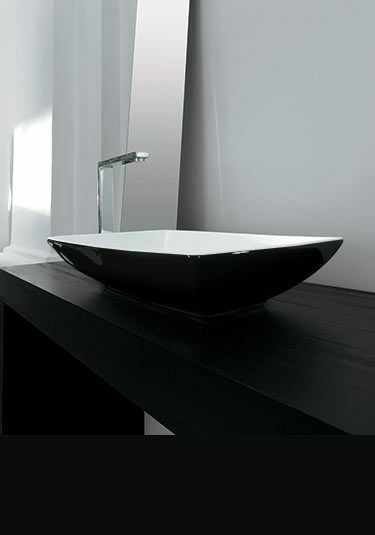 Very stylish designer basin with very large dimensions. 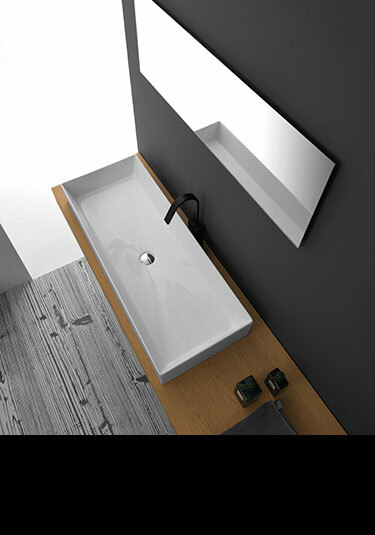 This flat designed basin is rectangular in shape and exclusive design choice for design led bathrooms. 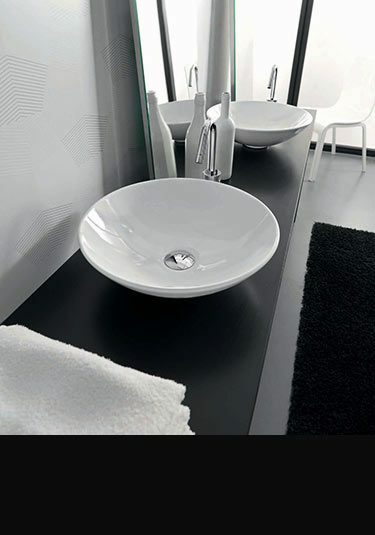 With beautiful floating styling, this designer counter top basin makes a lovely feature basin with a contemporary bathroom design. Luxury glass basins finished in a real gold leaf glass or silver leaf glass. These designer glass basins are an exclusive bathroom design which are made and designed in Italy. 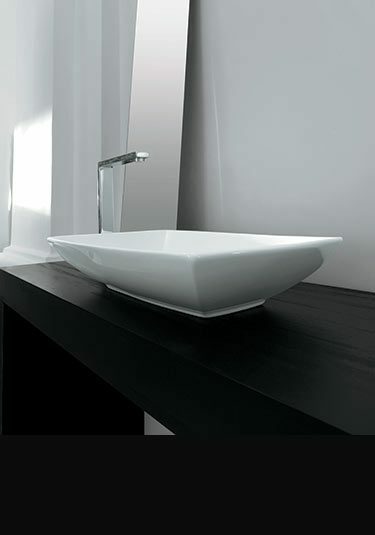 Luxury counter top washbasin in white ceramic. This low wash bowl is rectangular in shape with a flat top and sloping edges. Ideal choice for designer bathrooms. 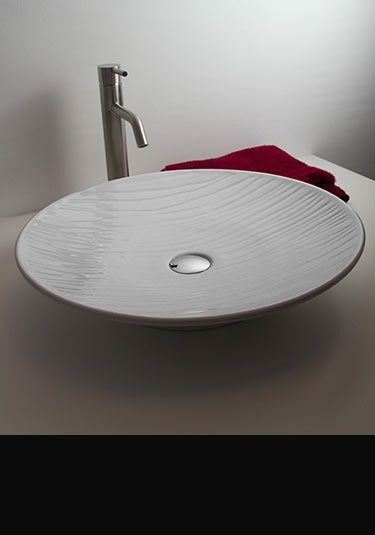 Italian luxury bathroom design this oval wash bowl is designed for counter top installation. 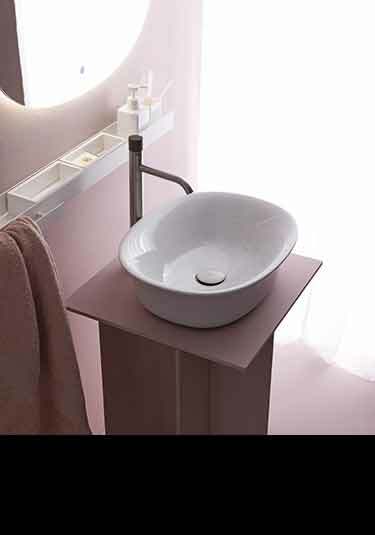 With smart but simple styling this wash basin is a great choice in contemporary design. A feature to any luxury bathroom design, these mosaic glass basins are made with a choice of copper leaf, gold leaf and silver leaf mosaic glass. Latest Italian styling. 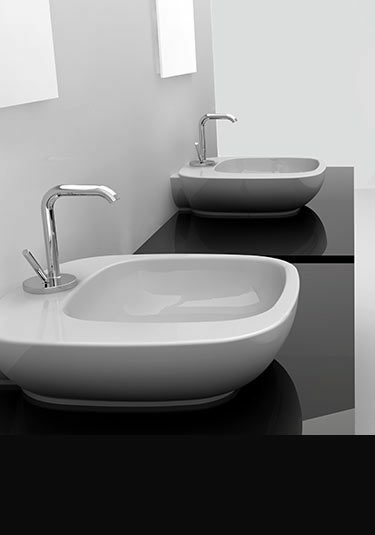 A designer counter top wash basin supplied in small medium and large sizes. 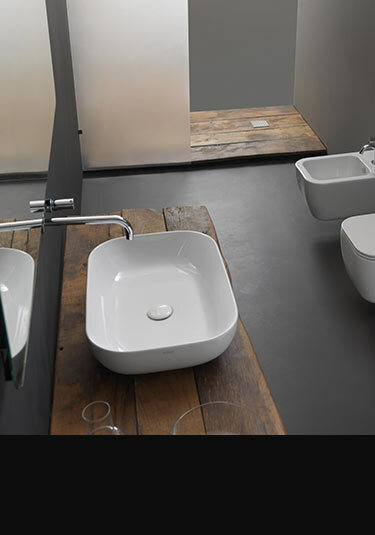 This attractive basin has a tapered top rim adding style to bathroom design. Designed and manufactured in Italy. A luxury designer basin in a soft shallow petal design. Made in the latest composite technology and ideal for exclusive bathroom styling. 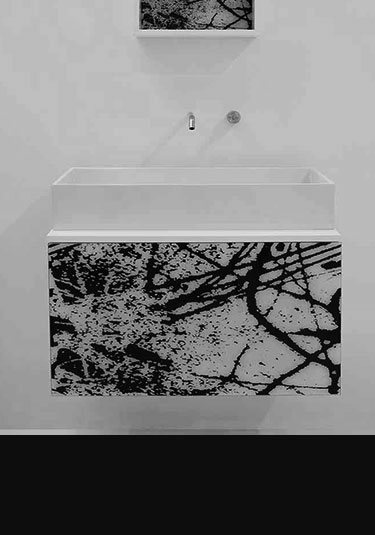 This contemporary sink is available in blue, black and white and makes a beautiful design feature. Italian designer wash bowl for work top installation. 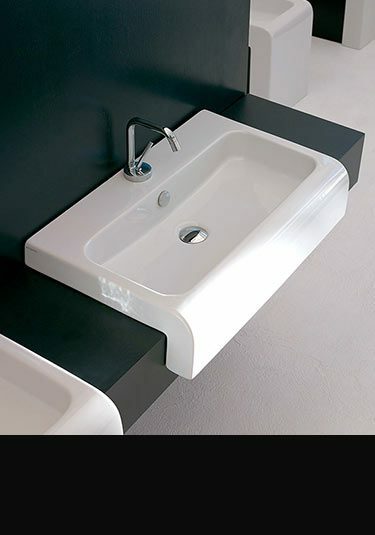 This contemporary basin can be supplied in white or black finish. 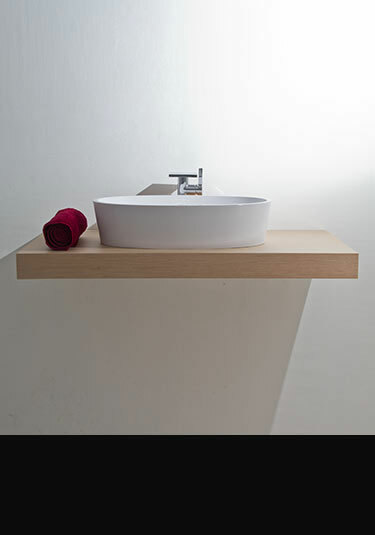 This contemporary wash basin is designed for inset fitting into a bathroom work top. 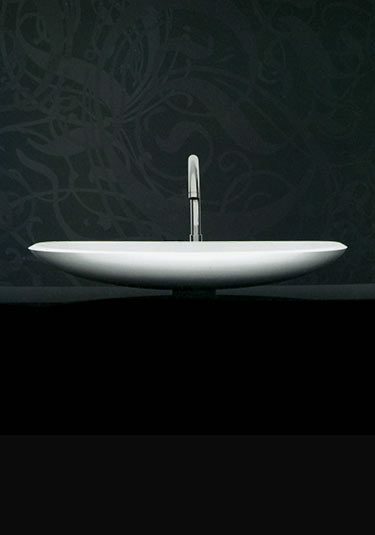 This designer sink is Italian designed and made in Italy ensuring the best quality. 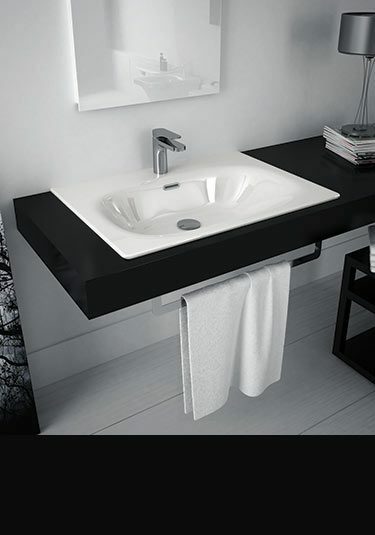 With contemporary styling, this black counter top basin has a contrasting white inside. 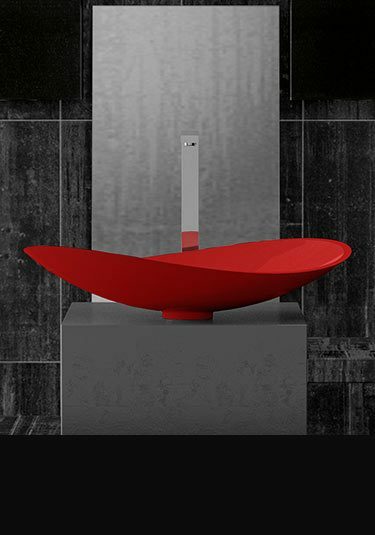 This coloured basin is a stylish design choice to luxury bathrooms and is Italian designed and manufactured. This impressive low counter top wash basin with a ripple effect moulded into the china is a unique design feature to any designer bathroom. This counter basin is available in white with silver and gold finishes to special order. A round counter top basin in a simple chunky design shows lovely contemporary styling in a high quality bathrooms. Made and designed in Europe. 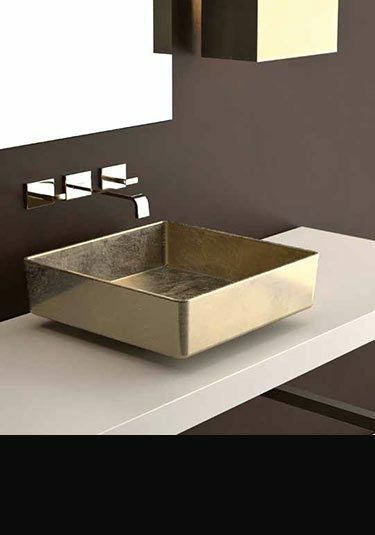 A stunning square sink available in gold or silver leaf finishes. This designer basin is top Italian styling. 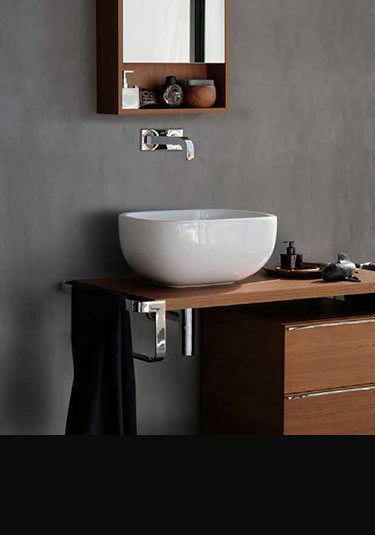 This Italian wall mounted sink is the latest in individual bathroom design. 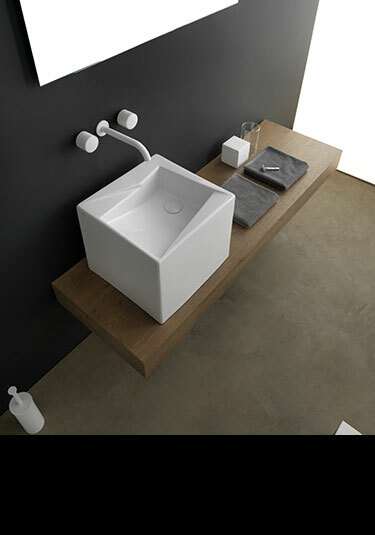 With its contemporary triangular styling and European quality this basin is proving a popular choice. A lovely styled counter top wash basin has a chunky but contemporary round design. Designed and made in Europe. 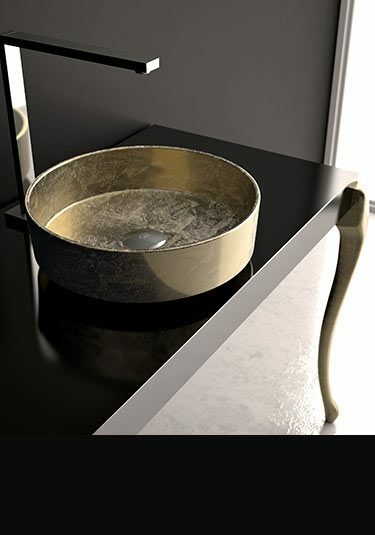 A luxury counter top glass sink with a brushed gold or platinum outer. Lovely contemporary styling and a feature basin for exclusive bathroom design. Classically contemporary in design this luxury counter top basin adds high quality to bathroom design. Made and designed in Italy. A designer work top basin designed to be inset into the counter top. 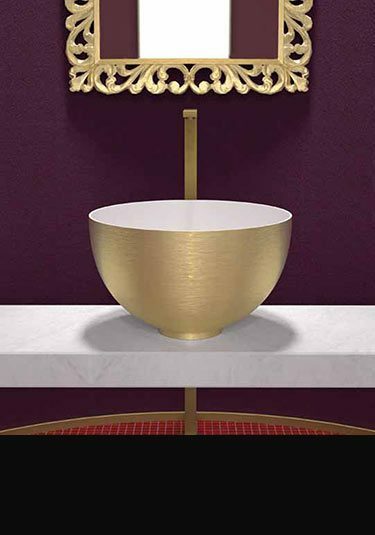 This nicely styled basin has a roll over front and is made in Italy in 2 dimensions. Lovely styled oval shaped wash basin for counter top installation. Designed and manufactured in Italy. A high quality round wash bowl with a built in overflow is a simple minimalist design suited for contemporary bathrooms. 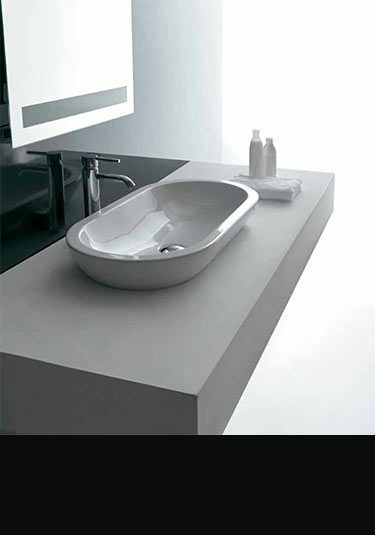 This oval wash basin is contemporary styled and is ideal for counter top installation. A counter top basin with its own tap ledge. 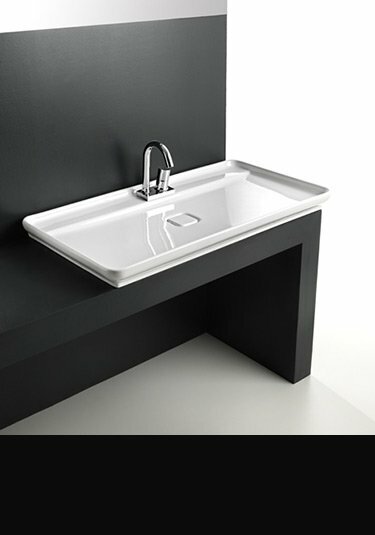 This deep work top sink is Italian designed and manufactured. An oval counter top wash basin made in white ceramic china. 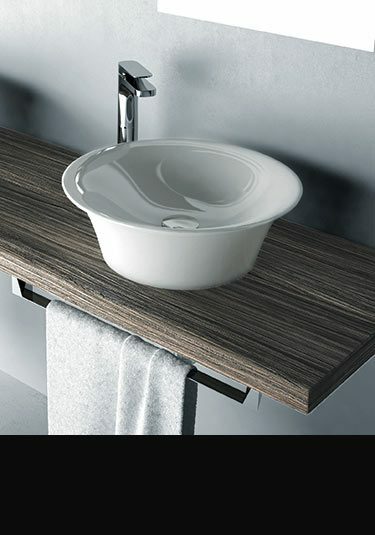 This lay on wash bowl has a build in overflow and makes a stylish design choice in high quality bathrooms. Deep counter top wash basins for work top installation. 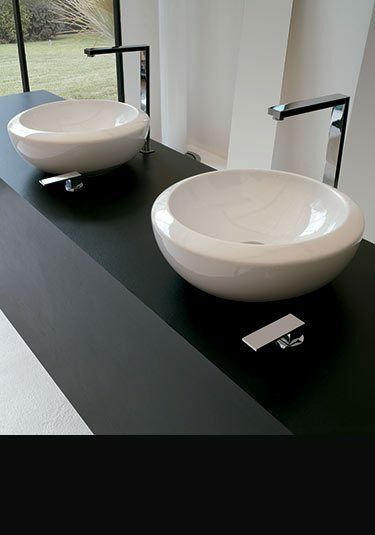 These Italian made deck mounted basins are contemporary styled. 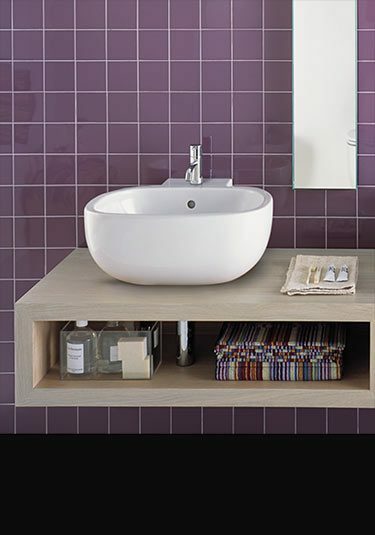 A semi-transparent rectangular glass basin available in 3 sink colours. European designed and manufactured ensuring design and quality.